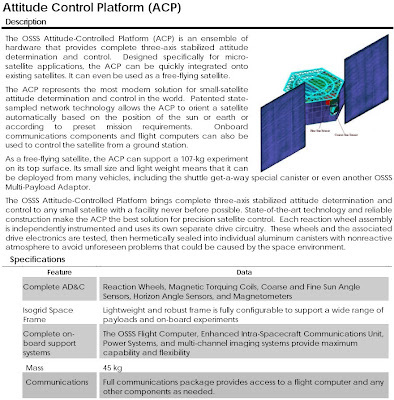 Designed as a stand alone bus for deployment from the NASA GAS or Get Away Special deployment system from the space shuttle, the Attitude Control Platform or ACP creates an ideal platform from which to mount any experiment to the top plate. Providing data transfer from the experiment to the ground via the ACP communication systems the ACP is designed to provide full atitude determination and control, a 12 or 28 volt power system and full VHF/UHF communications system. 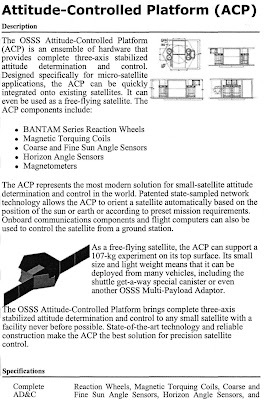 The system provides every thing needed for full satellite space craft functionality except the experiment itself. configured for a telescope mounted to the top, this is one of the primary design applications.